Today we hopped on the “T” and headed to the Museum of Fine Art. I love using the “T”. I get a sense of freedom that comes from not having the burden of a car and parking. It costs less than $2.00 for each ride and you can buy a card that is swiped on the gate or the ticket machine on the train car. There are even special rates for senior citizens, but an application must be completed before that rate is granted. The card can be “loaded” at several locations in town including convenience stores and kiosks in the stations. What a way to get around! 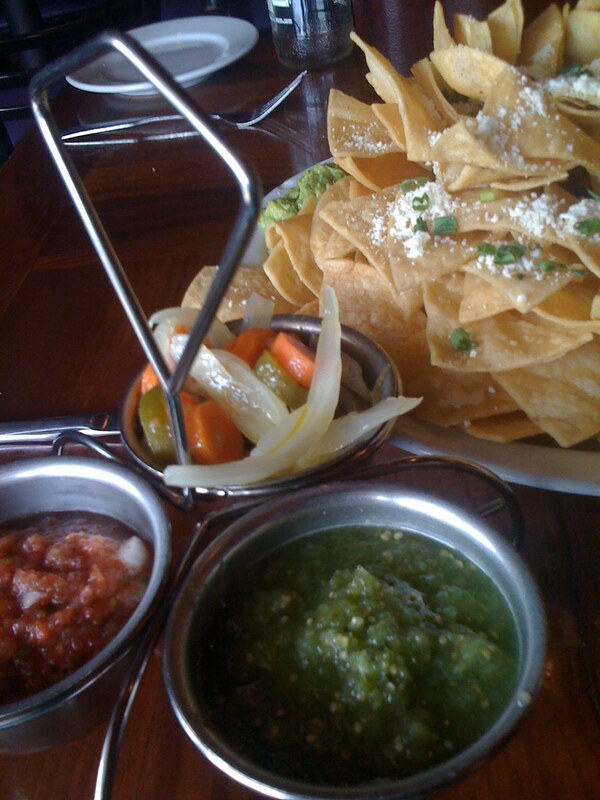 On our way we stopped and had a tasty lunch at La Verdad Taqueria. It’s across the street from Fenway Park and I can just imagine that it is packed on Red Sox game days. A sign in the restaurant touts that it is “like a night in Tijuana.” The tortillas are made fresh each day and the sauces are authentic and home made. We ordered guacamole and chips and were served a trio of sauces and warm chips seasoned with a grated soft white cheese in addition to the freshly made avocado dish. We also ordered an assortment of soft tacos that included some traditional flavors such as pork and fish and an unusual one made of tongue. All were excellent. We then set out on foot for the MFA. It’s just a few blocks away and the walk is very pleasant. Boston is very much a walking town. You don’t see very many obese people on the streets. I think it must be very healthy! Greg has a membership to the museum and we didn’t have to purchase tickets, so we entered at a rear entrance near the Japanese Garden. I have been to the museum several times, but had never seen this portion of the grounds. It was designed to mimic serene sites of Japan. 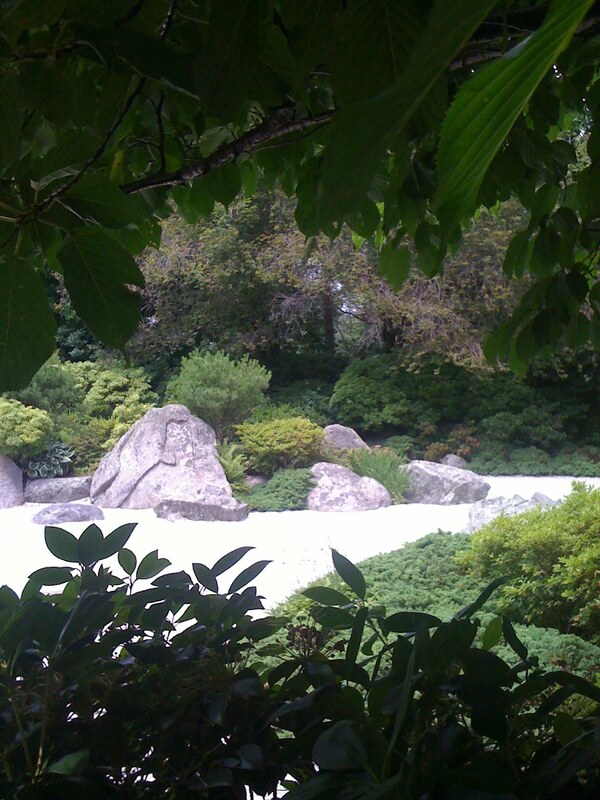 The sculptures and plantings combined to create an inviting setting for reading, relaxing and meditating. It was an amazingly quiet space in the otherwise hectic background of the traffic noises from the street. Once inside Greg showed me some of his favorite paintings and galleries. Since he purchased his membership he spends quite a bit of time walking around and exploring. I loved seeing the Talouse Lautrec’s Paris exhibit and the Egyptian exhibit. The Egyptian exhibit included mummies, but also gave the history of how the tombs were excavated. Amazing stuff! 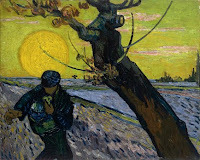 In the gallery with Impressionist art, I was treated to viewing Van Gogh’s The Sower displayed adjacent to Millet’s similar painting. The Van Gogh piece is on loan from the Van Gogh Museum in Amsterdam as part of the museum’s Visiting Masterpiece project. Van Gogh knew of the Millet painting and created his own version of the idea many years after the original painting. This is the first time that the two paintings have ever been exhibited together. It was impressive. I am now wondering which Visiting Masterpiece will be next. 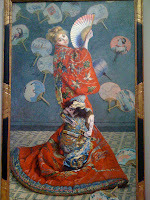 I have always loved the work of the Impressionists and the MFA has a wonderful collection including Monet’s painting of his wife, Camille, dressed in a kimono while wearing a blond wig. It's entitled La Japonaise. 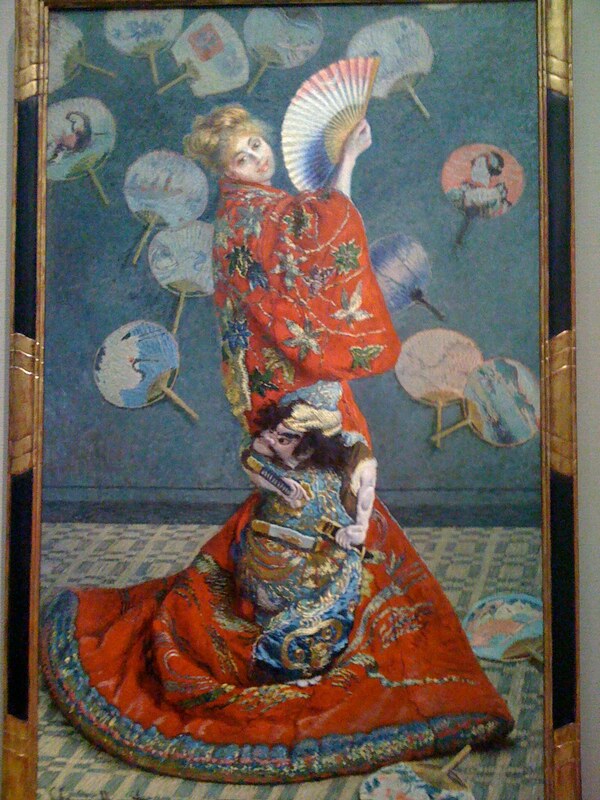 Monet was fascinated with the art of Japan and many have said that this painting was his way of creating art that Europeans would like while using an Asian theme. It’s a very large canvas and one of my favorites. In the gift shop, I purchased a miniature stained glass reproduction for my office at home. I love the way the sun shines through it to remind me of the lovely visit to the MFA with my son. Sauntering back to the “T” stop we walked through the Back Bay Fens. The Fens was once a swampy area and over time was transformed into a park area. It is maintained by the Emerald Necklace Conservancy in cooperation with the Boston Parks Service and includes a beautiful rose garden. I had seen the Rose Kennedy garden downtown the day before and was impressed that this site has also been maintained for the public. 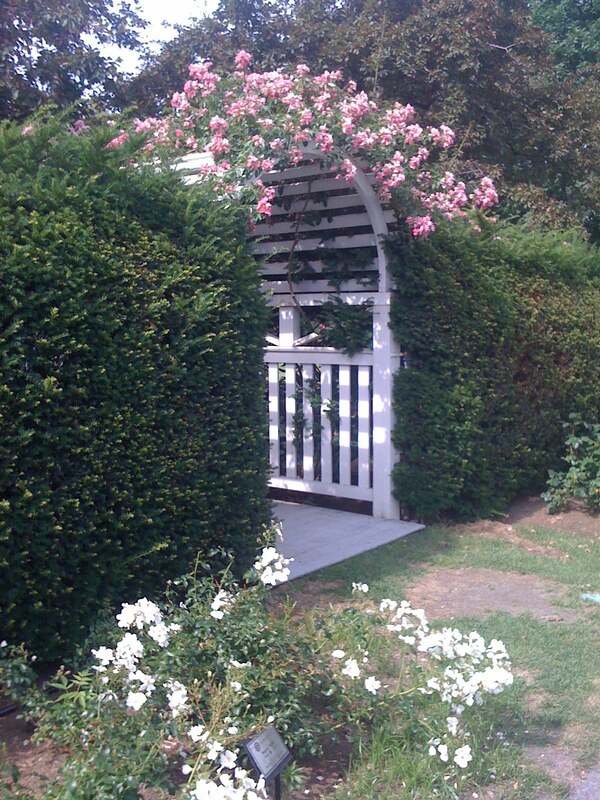 The Kelleher Rose Garden features over 200 varieties and 1500 plants. There are walking paths and benches. The summer is a great time to see the garden as most of the bushes were in full bloom. We had a full day, but decided to go back to Greg’s place and rest up for an evening in the North End. We had dinner at Nico Ristorante on Hanover Street. Hanover Street is on the Freedom Trail route and is a very busy tourist destination. The restaurants were packed and we were sans reservation, but were able to find a nice table at this place. The food was very traditional and satisfying. I really enjoyed the seafood risotto. We enjoyed the ambience and the service was good. No visit to the North End is complete without tasting some Italian pastries. We made our way to Modern Pastry which is on Salem Street. Modern and Mikes are the standards for the area. We stood in line for several minutes, but it was worth the wait. The cannolis and strawberry napoleon were delicious and a perfect way to finish our North End dining experience. What a day we had! Next time I will detail the third day of my Boston visit. Greg is quite a tour guide. It’s another one of his undiscovered talents! You're making really want to go to Boston! I agree about the freedom that public transportation offers. I wish we had that set up here! It's nice to not have to deal with parking and to be able to have that extra glass of wine and not worry about driving home. That was one really good thing about being in London. Thanks for reading. You are right about the extra glass of wine. Third and fourth installments to come. I was there for the week. So much fun..........you do need to go. Sounds like a great trip. I love your writing style, it's very informative. I love public transport too. Not so much for evenings as it isn't comprehensive enough, but for a few hours shopping in the city I'll always take the bus rather than pay a fortune to park the car. I live in a town in Louisiana where there is bus service that goes no where I want to go. So...when I visit a large city I love using the systems they offer. Where I live, one can't even walk to a grocery store. Everyone drives everywhere! Can you imagine the traffic?? ?